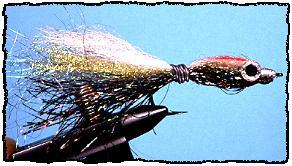 Mega-Minner - Fly Angler's OnLine "Intermediate Fly Tying Part 46"
OK, so the title sounds like a good old boy discussing his favorite bass bait. In a sense, that's exactly what this is, except us fly-fishin' folks call 'em flies. And, it's also a good pike fly, or saltwater fly, or good fly for anything big and hungry. 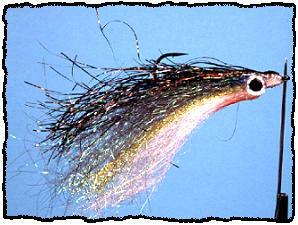 Bob Clouser gets the credit for the inspiration but not the total design of this fly. 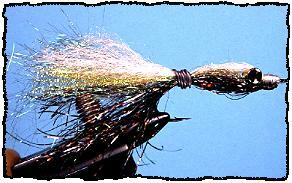 As with many other flies, the Mega-Minner is a modification of a great working pattern, the Clouser Minnow. 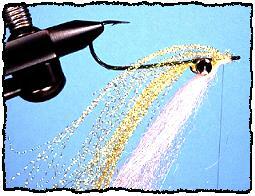 This modification is geared towards saltwater and big hungry pike. It also can be used to fool lake trout and bass. The idea for this fly is pretty simple; take a fly that fools fish well, and make it swim like a jig. The upturned hook, heavy hourglass eyes, epoxy style head and prismatic flash of the oversized eyes coupled with flashy body materials are just what the fish doctor ordered to fool a hungry predator. Once again, this fly was created for adaptation. You have the choice to change colors and sizes to match the local baitfish populations. If you want it to go deeper, change the size of the hourglass eyes. It's really designed for the bottom run anyway, so tie it that way. The main technique to learn here is how to manipulate the body materials to achieve the desired effect. In reality, that is precisely what fly tying is all about anyway. You manipulate the body materials to achieve the desired look, shape and effect. This fly just takes that idea one step further. Here, we manipulate the materials around the head to achieve the minnow profile we want. You'll need a twist-tie or some soft wire in addition to the listed body materials. This isn't going to be part of the body, but will be used to hold the body in shape until the epoxy or finish used on the head has a chance to dry. If you like to experiment a little, you can add mylar tubing over the hourglass eyes before you glue on the prismatic eyes and dip the head in Angler's Choice thick Soft Body. It gives the fly a lot of flash, and looks pretty good too. Hook: Any straight eyed hook that's 2X long or longer. Sizes 6/0 to 2. 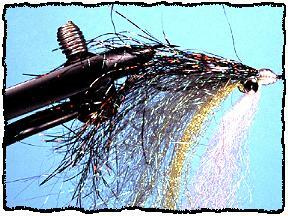 Body: A mix of Anglers Choice Poly-Bear synthetic hair, crystal flash and holographic fly flash. Any other flashy materials will also work. 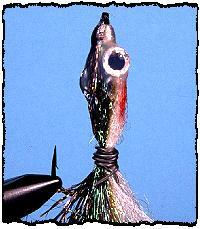 Head: Body materials and monofilament thread covered with epoxy or Angler's Choice Soft Body finish. Eyes: Lead hourglass, then prismatic, glued on and covered with head finish. 1. Start the thread and tie in the hourglass eyes about 1/3 the hook shank back from the hook eye. Use figure 8 wraps to secure the eyes. A drop of super glue should hold them firmly in place after you have them tied on securely. 2. Tie on some crystal flash. 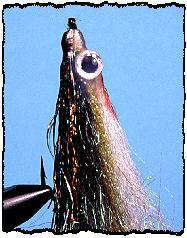 Secure it on both sides of the eyes like you did in the Clouser Minnow. 3. Next, tie in the lightest color on top of the hook (I'm using white Poly-Bear hair from Angler's Choice), but don't tie it down behind the hourglass eyes. Flip the hook over and add another bunch of chartreuse crystal flash. Again, don't tie this down anywhere but behind the hook eye. 4. Add the third color, progressing from the lightest colors on the bottom (as you view it currently in the vise) to the darkest colors on top. I'm using Poly-Bear for the third color. Try to keep the length of all the body materials close to the same. 5. Tie the darkest material on top. (Black Holographic Flash used here.) Don't let the materials spin around the hook. 6. Build up a solid head of mono thread. Whip finish and trim the thread. 7. Use a twist-tie or soft wire to bind the body materials to the hook temporarily. Try to keep the materials from spinning around the hook. 8. Use a red waterproof marker to give the light (underside) parts of the fly some color, and a black marker to color the top side of the head dark. Glue the prismatic eyes to the hourglass eyes with Angler's Choice thick Soft Body resin. 9. Dip the head to behind the eyes in Angler's Choice thick Soft Body resin (epoxy will also do the trick). Smooth the resin out toward the tail with your finger. Allow it to dry until it starts to thicken. 10. When the Soft Body resin is thick enough to hold its shape without sagging, remove the wire that's holding the body to a tight shape. Allow the head to dry thoroughly. Clean out the hook eye with a needle before the finish dries completely. 11. When you're finished, the fly should look something like this. The colors may vary (it's your choice, after all), but the shape should be similar. The head will retain its shape while the body and tail breath in the water. It's a look hungry predator fish find hard to resist. 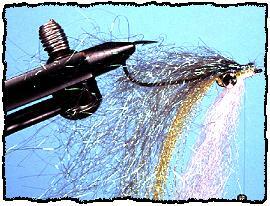 You saltwater folks should use stainless hooks whenever you tie any of these flies. A friend of mine who used this pattern off the southern coast of Florida says it is a killer for barracuda and something he calls Jacks. 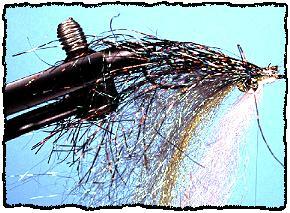 I use it on pike, walleyes and structure-hugging bass. It seems any minner-eating fish will gobble it up, and the upturned hook doesn't find many weeds.